The very term superstition denotes that it is a conclusion not based on rational thinking and evidence and hence has to be anti human rights. 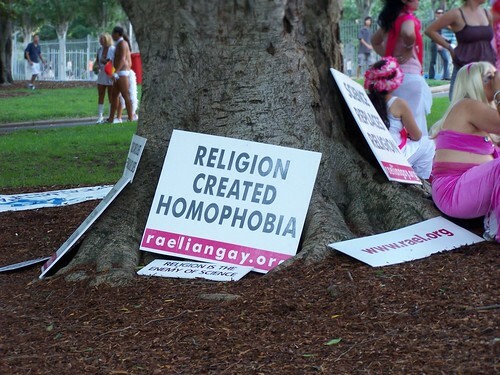 Because human rights respect individuals rights to hold beliefs, express them and also live a life of ones choice. The superstitions are naturally against these. Most of the superstitions are linked to religion. Though religion is not all superstition and also the other way round, most of the organized religions are based on revelations made to an individual and hence irrefutable. That something is held to be irrefutable is per se against human rights because it is a basic human right to believe or not to believe in anything. Besides, the very concept that all human beings are equal is negated by many religions where things like caste are a basic tenet. If one has to respect human rights then equality of all human beings regardless of their nationality, language, color, ethnic origin, gender, sexual orientation should be considered as equal which none of the religious dogmas agree with. Again, all religions have dogmas which are beyond question. The very fact that something is beyond question is a negation of human rights. The only thing perhaps that one can consider irrefutable is the concept of human rights itself. Let us examine some of these to understand how these are anti human rights. That all humans are equal is fact which is negated by all religious dogma. Even those which preach the universal brotherhood of man qualify their statement by the term being applied to only to those who follow their irrefutable dogma! Some by their very definition divide human beings in castes and specify functions for each one of them which again negates human rights. These religions also use very derogatory terms for those who do not follow their system of faith or worship. Even after death the religious beliefs determine what happens to the body and the non existent soul! The very dignity of a human being after death is determined by many superstitious beliefs. The disposal of the mortal remains is again determined by these superstitions. The interred bodies have been even exhumed for these religious and other superstitions and even the dignity of ones mortal remains has not been maintained due to these. That all humans are equal has been accepted in the Universal Declaration of Human Rights but this is not respected by superstition based religions. Though the human genome project has proved beyond any doubt that the genetic composition of all humans is the same but for very marginal variations, the superstitions do not let us accept that. There is a class of people who are said to be in closer contact with the so called power or powers that run the whole universe and hence ordinary mortals have to seek the intervention of these many times self appointed agents of this divinity. While the existence of such an entity is a matter which is questionable, even if one such exists it is debatable as to only a few select ones can have access to this! So, the very concept of priesthood is a violation of human rights. Every human being has a right to happiness in his/her own way as long as it is not causing any problems to others. But, the religious dogmas based on superstitions would not allow that. They expect human being to find happiness following the lines put down in their dogmas and follow them unquestioningly. Many of these lay emphasis on suffering and austerity for their followers (mind my word- followers –not for those who preach) promising them all delights in the life beyond- a total superstitions because there is not a shred of evidence that there is anything existing beyond death or before birth. The Karma theory is a total anti human right concept- putting the blame or credit for what is happening in the present life to ones deeds in a previous incarnation again a concept which is utterly non science. 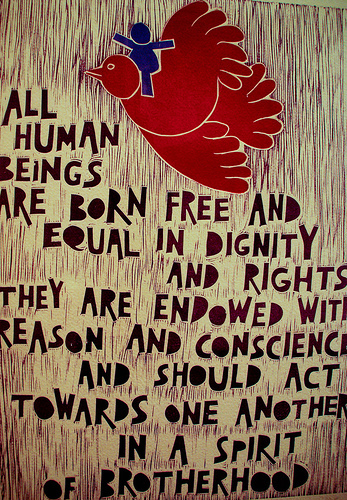 Every human being has a right to express his/her views. There are blasphemy laws in superstition based societies which are against human rights. If one has the right to propagate ones religion then the non believer has the fundamental right to question them. This right is denied to the non believer by the blasphemy laws which are in force in many countries some of which have made it a capital offence to question their book or their prophet. These laws are in existence even in a secular democracy like India- though not called exactly that! They have been given a different name like spreading hatred among different communities etc! The right to blasphemy is a human right and must be accepted that as much as one ahs the right to put forward claims, the others have also the right to question them. With a large number of the population turning out to be non believers their rights of non-belief cannot be suppressed. Women constitute 50% of the human population and violation of their rights is that of half the population. The rights of women are always infringed by the superstitious practices followed by the perpetrators of atrocities in the name of religion. The Abrahamaic religions all look down upon women as the one who had brought the downfall of mankind! So, the rights of women are trampled upon by the religions by various methods. This attitude is so morbid that when anesthesia was first discovered it was said to be all right in all its applications except for the alleviation of pain during childbirth because god had decreed that the woman shall bring forth children struggling and crying in pain. This is but one such example superstitions have made women as second rate citizens in many religion based societies. The position of women in many of the Islamic states is well known including punishments like publicly stoning to death and such. Their bodies are used as trade offs in tribal feuds; women are treated as chattels, like cattle and denied the pleasure of their own bodies by practices like the genital mutilation etc. It is no better in the societies like India and Nepal where they claim that gods dwell where women are honored. The Manu smriti keeps them as bonded slaves to men all their lives because of the superstition that women cannot be trusted to be independent! Their reproductive cycles are closely monitored as they are considered to be unclean during their menstrual periods and banned from all contact with their family members during that! Some temples have a no entry policy for all women. All these superstitious practices and are violations of their human rights. This gets carried to such an extent that even the statutory posts held by them are only as representatives of the men who control their lives. The reservation of some seats in elected bodies for women has resulted in them being only nominal members of the body all the required decisions are taken by their men folk and these women are only rubber stamps. The basis for this is again the age old superstition that women are inferior to men! The basic human right to have a sexual relationship between two consenting adults is again interfered with by the myriad of superstitions that are the bane of our society. This baggage of the primitive tribal past is carried even when the believers go to liberal, secular societies where there are the laws of land which uphold human rights. There are honour killings, kidnappings, forced marriages, divorces and even public hangings. There are these primitive superstitions about consanguineous marriages between couples who are cousins to the nth degree on the paternal side. But, the same is not applicable to the maternal side! Any way, these primitive superstitions have resulted in Kangaroo courts handing down sentences like husband and wife should live like brother and sister, married couples should be put to death and so on. This has led to public lynching of the ‘guilty’ parties and even vendettas. These superstition ridden societies are such a strong electoral lobby that no govt. in power or any of the opposition parties dare take them on! As for homosexual relationships, the superstition ridden mind sets have made it a disease because of their primitive attitudes that such relationships are ‘unnatural’! While celibacy which can also be said to be so is revered and celibate men in particular are worshipped, those women who do not get married are shunned. The superstition that a widow is inauspicious has resulted in gross violation of their human rights. 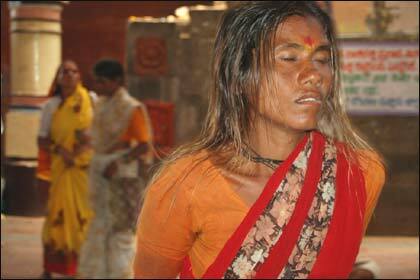 They are banned from wearing jewellery, taking part in religious functions and are shunned by the society. In some places they are branded as witches and their property usurped, their basic human right of ownership of property being taken away from them by the superstition mongering vested interests. Even in inheritance matters women were not allowed to inherit the ancestral properties till recently. The change in the laws of inheritance for Hindus, have made women co-parcenaries for the property of the Hindu undivided family but in some other religions like Islam they inherit only a fraction what their male counterparts get. The violation of the rights of the child is an off shoot of the superstitious attitudes of the society. Since children are more vulnerable they are made victims very often? This victimization may be anything from the sacrifice of a child to its genital mutilation. Mentally, children are denied their human rights like say to education- which is a human right of a child. There are religious institutions which force them into becoming priests without their consent. Though this practice has come to an end in most of the civilized societies it is still prevalent in countries which are less developed. In India we seem young children being forced into religious schools and denied proper education. Again we see superstitions being imposed upon young innocent children- it is a common one that many blood thirsty gods and spirits need the blood of innocent, young children and we see instances of such ritual sacrifices in many parts of India to appease gods. Superstitious beliefs not supported by any medical evidence like vaccinations cause diseases and such leave children open to infections by many preventable diseases and are a violation of their human rights. That vaccinations cause a host pf problems outweighing their beneficial effects is a common superstition in our country. The same is also applicable in cases where medical treatment is denied to children or replaced by some superstitious, irrational quack therapy is also a violation of human rights. In fact parents have been convicted of man slaughter for subjecting their children to quack therapies resulting in the death of the child. Mental illness is a major cause of human rights violation connected to superstitions. In the primitive societies mentally ill are said to be possessed by demons and spirits and their human rights are violated under the pretext that whatever abuse that is being done is to the spirit possessing the patient and not the patient! So, all sorts of torture, beatings, deprivation of liberty is done under the guise of exorcism. The patients are subjected to all sorts of human rights violations and no action is taken even if complaints are made by the victim. We have instances in India where psychiatric patients have been chained and were burnt to death when the premises caught fire. There are instances where beatings to exorcise demons have resulted in deaths of the patients. These human rights violations are ignored as the near relatives of the victims are also subject to these superstitious beliefs and think that these barbaric violations of human rights are an essential part of the treatment and are being done for the patients well being! Here we have an overview of some of the major human rights violations in the name of superstitious practices. Many times they are given a cultural mask to remove the basic underlying superstition. These may be like playing religious music loudly at all times, blocking the right of way for other citizens, disturbing the peace by setting of noise makers like crackers etc. Many times these are claimed to be cultural practices going back to centuries though we know very well that the technology driven things like sound amplifiers have come into use only a few decades back. People are denied the basic human right of consuming the food which their usual diet under religious pretexts linked to superstitious beliefs, forced to wear dress which is not suitable for the climate etc. So, if we have to develop as an economy and in terms of human development index we have to pay a lot of attention to human rights, Their violations should be dealt with very strictly and people must be educated that in a civilized society where there are laws, they override all religious and superstitious beliefs which are in violation of them.